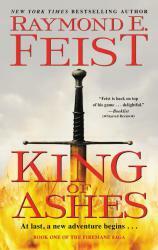 The first volume in legendary master and New York Times bestselling author Raymond E. Feist’s epic heroic fantasy series, The Firemane Saga --- an electrifying tale of two young men whose choices will determine a world’s destiny. As a Free Lord, Baron Daylon Dumarch owes allegiance to no king. When an abandoned infant is found hidden in Daylon’s pavilion, he realizes that the child must be the missing heir of the slain Steveren. The boy is valuable --- and vulnerable. A cunning and patient man, Daylon decides to keep the baby’s existence secret, and sends him to be raised on the Island of Coaltachin, home of the so-called Kingdom of Night, where the powerful and lethal Nocusara, the "Hidden Warriors," legendary assassins and spies, are trained. Soon, the two young men --- an unknowing rightful heir to a throne and a brilliantly talented young swordsmith --- will discover that their fates, and that of Garn, are entwined. The legendary, long-ago War of Betrayal has never truly ended...and they must discover the secret of who truly threatens their world.